Last week was pretty exciting in my life as far as domestication goes ;). Until a friend who knew I was looking for a yogurt maker found one, unopened and brand new, for $3 at a yard sale. So will all of you ladies who do it without be merciful to me for caving to such strong temptation? I now own a yogurt maker. The term "yogurt maker" is a bit deceptive, since you still do all of the milk heating and proper temperature readings on your own. 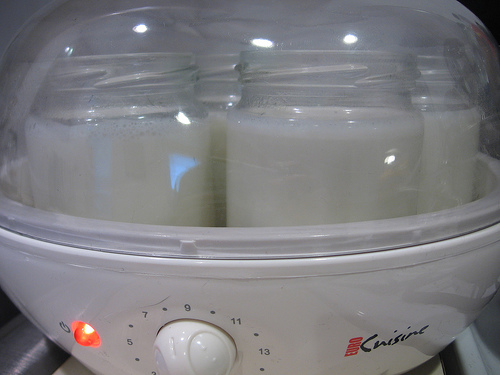 All that it does is provide fancy jars to put the yogurt in, and an incubator for keeping the yogurt warm while it sets. Despite a few minor disasters (namely, following advice for a quick cool down of the yogurt and over cooling it- oops! and then not letting it set for quite as long as I should have), the yogurt came out pretty well, and I will be making it myself from now on. I want to try it a few more times with the machine, but eventually I hope to do it without, and perhaps to even try it in the slow cooker (how cool is that???). Not only did I make homemade yogurt, I also took my first stab at dried beans in years. 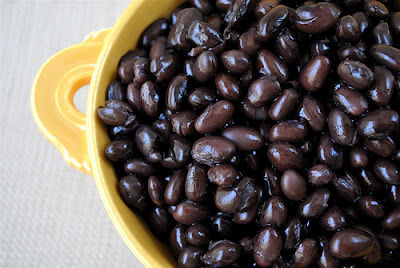 I had a bag of black beans that cost under $2, and followed Trina Holden's directions from her book on how to prepare them. In the end, for less than $2, I had the equivalent of five cans of beans, in can-size portions, ready to go in my freezer. Beyond exciting! These little projects made my week so much more fun and exciting than usual. While I love to try (key word, try) to keep a clean and organized home, and I love trying to follow my neat little routines every day, adding a random project to the mix really energized me. I've decided that I need to add more of these fun (while useful!) projects into my life. It may mean a messier home, or a little less order... but the extra joy and energy that comes with these endeavors is really rewarding! All that to say, I am looking for new project ideas (preferably in the whole foods department, which I am trying to ease my way into, or even crafting, I'm game for whatever!). Your suggestions are welcomed! What domestic endeavors do you find joy in? How did you freeze the beans? Just in freezer bags? In glass jars :)! I didn't even have to buy them :). Trina recommended saving ones from the store (like what your spaghetti sauce, peanut butter, and pickles come in) and reusing them. Love it!!! I need to try doing beans again! Last time was a failure! Past by "your way" on the 4th on our way home! Thought of you! I hear you- they usually end up too hard for me! This time I just let them keep going, and eventually they got soft. So fun! We will have to meet up sometime, almost "neighbor" :). Haha I don't blame her! it is scary! I am still scared :).